Pesky “P” Leads | Tennessee Aircraft Services, Inc.
Our Cessnas are designed with certain redundant systems; two fuel sources, back up electrical source (battery), dual magnetos, etc. Each redundant system has some area of common connection or weak point that must be carefully maintained to ensure the reliability of the entire system. Often the weak point is some very simple item that rarely gets much attention during inspections. Magneto “P “ leads are very simple pieces of wire but have the capacity to ruin your entire day when they fail. The purpose of the “P” lead is to disable the output of the magneto by shorting its primary coil to ground. The three most likely failure modes of the “P” lead is a short to ground, an open, or intermittent between grounded or open. A short to ground will totally disable the magneto. An open allows it to fire any time the magneto is rotated which is a particular danger if the prop is rotated by hand for some reason. An intermittent short or open not only creates operating problems but seriously messes with a mechanic’s mental stability. Prevention of these three possibilities is not difficult but does require just a little special information. When the ignition switch is in the “BOTH” position the “P” leads are effectively disconnected from the magnetos. While in this condition, some of the coil energy rides on these “P” leads to the tune of about 150 volt pulses. These voltage pulses occur every time the magneto fires and are used by some digital tachometers to generate RPM displays. A four cylinder magneto fires twice per engine revolution, and a six cylinder fires three times per engine revolution; the digital tachometer merely does the math and puts up the appropriate display. The pulsating direct current on the “P” leads effectively becomes alternating current without the negative pulses when the engine is running at cruise speeds. A six cylinder magneto running at an engine speed of 2700 revolutions per minute translates to 8100 pulses per minute or 135 per second. This relatively high frequency and high voltage will wreak havoc on avionics audio systems and Automatic Direction Finders (ADF). Shielding the “P” lead wire is the remedy. Shielded wire is a standard insulated wire with a braided wire wrapped around it. Usually another layer of insulation is added outside of that to protect the shield. Antenna coax is a type of shielded wire intended to protect its carried signals from outside interferences. 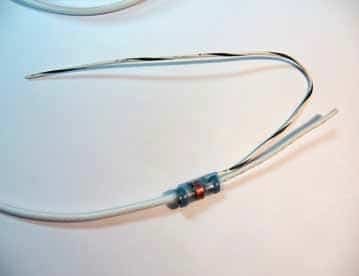 Strobe systems often use a shielded wire from the circuit breaker to the power pack for noise suppression. Audio wires use shielded wires and should have all the shields grounded at the same point for best effectiveness. One unique feature of the “P” lead is that most of it is exposed to the harsh environment of the engine compartment, complete with major temperature swings, oils, cleaning solvents, and vibrations. Of all the wires in the plane, the “P” lead probably gets disconnected and re-connected more than any other wire. All this translates to excessive wear with need for more care during maintenance and close attention during inspections. Avionics guys/gals deal with shielded wire every day and have all sorts of special tools and tricks just for them. Your local mechanic so seldom has to repair or install shielded wire, he/she may not be well versed in the various common failure points or repair methods. The most common fault is a broken shield lead at the magneto which can totally negate the electrical noise canceling ability of the shield. It’s also commonly ignored due to lack of knowledge of appropriate repair methods. When inspecting the “P” leads at the magneto end one should look for frayed strands on the grounding braid. These very small wire strands must be twisted together for support or they may break easily. To expose the wires’ center conductor for detailed inspection, the braid should be pushed up the center wire like pushing up the sleeve of your shirt. The center wire insulator often gets thin and cracks at this point allowing the high voltage spike to arc to the shield. Any evidence of cracks in the insulation or dark spots indicating arcing is cause for repair. Repair of a damaged “P” lead requires cutting off the offending damaged length, then separating the shield from the center conductor and attaching each to the appropriate post on the magneto. This pictures shows the shield pushed back to reveal the exposed wire from the center conductor. This messes with the mechanic’s sanity. 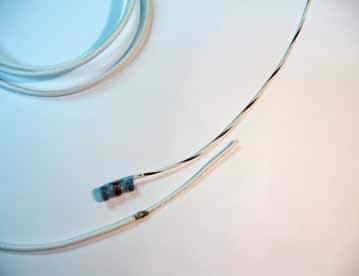 One repair option is to install a pre-made heat shrinkable device with a ring of solder and a grounding lead built in. The wires’ outer insulator is trimmed away about two inches from the end using a fresh razor blade. 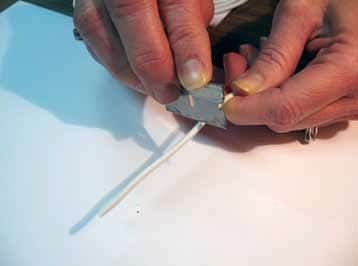 The blade is pressed through the insulator until just touching underlying braid. A sawing motion with the blade will score the braid causing many strands to break. The braid is then cut about 1/8 inch from the new edge of the outer insulator using the same method with the razor blade. Care must be taken to prevent cutting into the inner wires’ insulator. The narrow ring of exposed braid is the contact point for the solder ring of the heat shrinkable part to melt into. Terminal ends are then crimped on the newly installed ground wire and the center “P” lead. 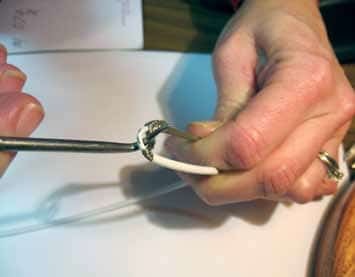 Press the blade into the outer insulator just until it touches the underlying braid. Too much and the braid strands will break. Braid pushed up the center conductor opening the braid enough to begin and opening for the center conductor. Heat shrink ground device before installation showing solder ring (slightly red in color) with ground wire inside blue colored heat shrink tubing. Heat shrink ground device after solder ring melded into shield and ground wire by heat gun. Braid opened and wire bent to allow center conductor to be pulled through. Another repair method involves no special tools other than soldering tools and a proper pick. As in the previous procedure the outer insulator is trimmed off about two inches from the end of the wire. The shield is pushed up the wire creating a bulge in the shield near the freshly cut edge of the outer insulator. 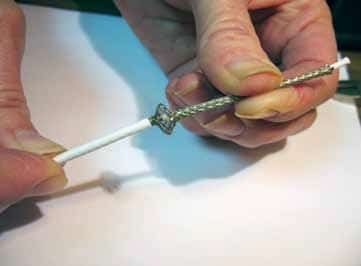 Using the pick, carefully create a hole in the braid. Slowly bend the wire away from this opening as you continue to enlarge it. Eventually, the wire will be bent 180 degrees and the center wire can be pulled through the opening. The braid can now be pulled and twisted to create a strong conductor for the ground lead. Added strain relief can be had by adding short bits of heat shrink tubing where the braid now departs the center wire. Wiring repair is not on the list of items the FAA says the owner/operator can do. However, when you have the cowling off for that next oil change or spark plug cleaning the “P” leads could certainly get a looking over. 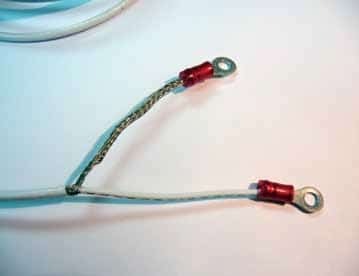 Look for frayed shield braid and give a gentle tug on the wire at the terminal end just to ensure it’s connected well. Care for “P” leads is truly an ounce of prevention returning a pound of cure.